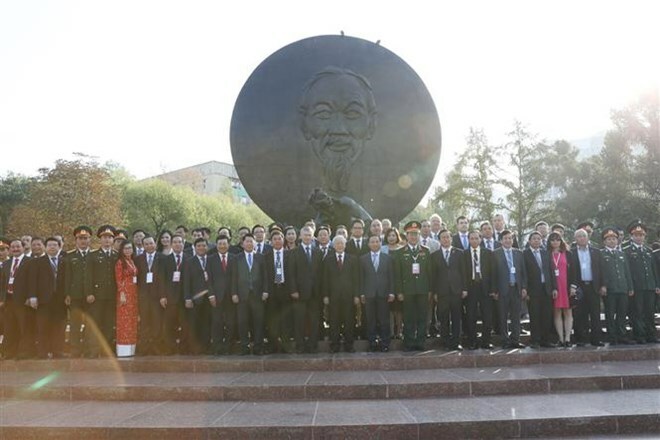 Moscow (VNA) – General Secretary of the Communist Party of Vietnam Nguyen Phu Trong and the Vietnamese high-ranking delegation laid flowers at President Ho Chi Minh’s statue in Moscow on September 6 as part of their ongoing visit to Russia. The ceremony drew members of the Russia-Vietnam Friendship Association, the Association of Russian Veterans of Vietnam, officials from the Vietnamese Embassy in Moscow, and a large number of Vietnamese people living and working in Russia. The participants spent a minute’s silent in memory of the late President who was a national hero of Vietnam and a great friend of Russia. 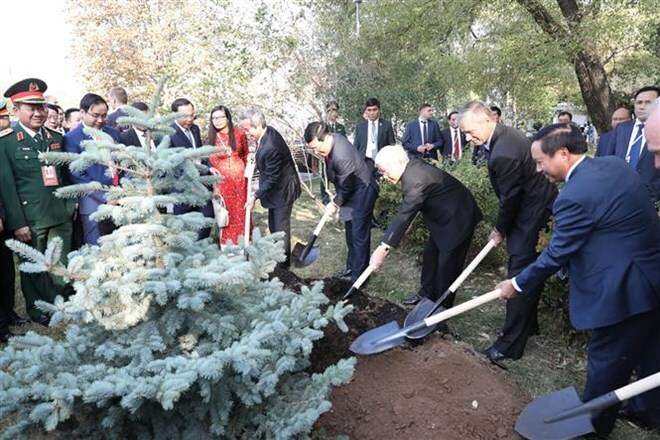 Following the ceremony, General Secretary Nguyen Phu Trong also planted a tree near the President Ho Chi Minh’s statue. In the first day of his Russia visit on September 5, the Party chief had meetings with Russian Prime Minister and head of the ruling United Russia party Dmitry Medvedev, and laid flower at the Tomb of the Unknown Soldier in memory of heroes who fell down in the Great Patriotic War, paid floral tribute to the leader of the world’s working class and workers’ movement, Vladimir Ilyich Lenin at his mausoleum.